Talk of organic fertlizers and animal manure is up there in the top 5 if not top 3, in my opinion. I remember scooping up carabao droppings with a shovel by the roadside when I was young. Farmers then rode carabaos to the fields and these animals would poop just about anywhere. This was in my youth when carabao manure was the only fertilizer I used to feed a lone grapevine. Sadly, I don't remember that grapevine bearing any substantial amount of fruits until it died! With fertilizers, I still feel though that "organic" is the way to go. That's because it is cheap, if not free. To apply aged cow manure fertilizer, you only have to put in around the base of the plants like a top dressing. Watering the plants breaks down the manure and the nutrients would eventually leach into the soil and taken up by the plant roots. The first time DH and I thought of gathering cow or carabao manure from the UPLB campus was when we learned they sell carabao milk. I knew the university had agricultural sciences, but wasn't sure they actually kept livestock there until I saw this arch on the road. 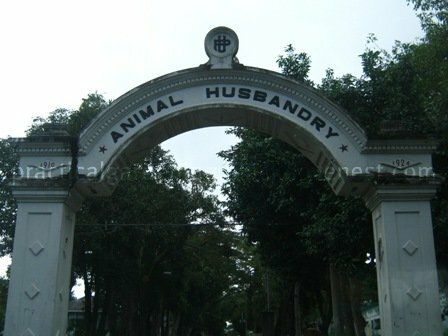 Yup, "Animal Husbandry" spelled livestock too. And so we planned on coming back with some bags or sacks to hunt for cow manure, cow droppings, cow dung or whatever else it's called. Entering this arch and then following the road that turned right led us to a small building that looked like a stable. There were a few cows in them and a lone carabao tied to stake in a nearby field. There was also a goat with a metal-like contraption attached to its side. I'm guessing it was for milking purposes, since I heard the campus also sells goat cheese. We asked a farm hand where we could get cow manure that wasn't wet. He directed us farther up the road to an empty stable. He said we had better chances of collecting dry cow manure inside that empty stable. After all, it was the rainy season. While the grass and the ground was wet outside, inside the empty stable it was dry. 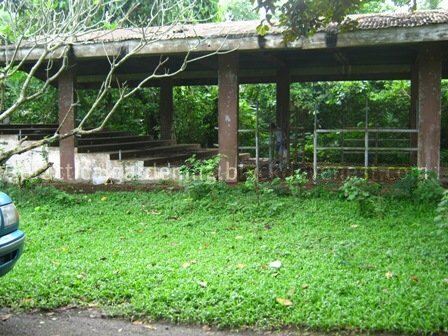 This stable (as shown above) is like a corral where the animals are led inside when it rains. The corral is very old and I'm guessing so is the cow manure that scattered on the floor. 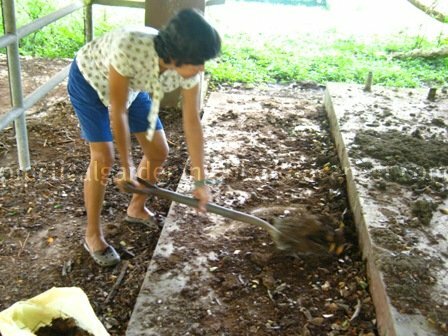 Mixed with the dried cow manure was organic matter like leaves, twigs and grass. Some of it has decayed well while some is in various states of decomposition. Fortunately, we remembered to bring a sack and some plastic bags inside the van. We also brought along a shovel, just in case. Here, DH shovels cow manure and composted organic matter into the sack. 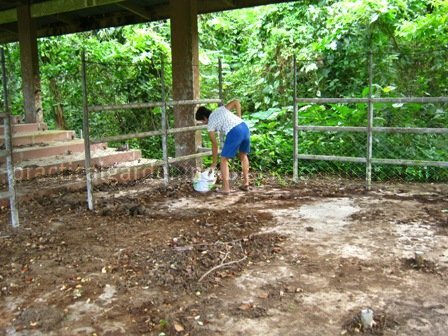 There were piles of organic matter on the floor that had plenty of crawling red ants and we avoided those areas. The cow manure had dried up in clumps and didn't smell at all. I suppose the airy corral and plenty of sunshine outside composted much of the cow manure and other organic material inside the corral. 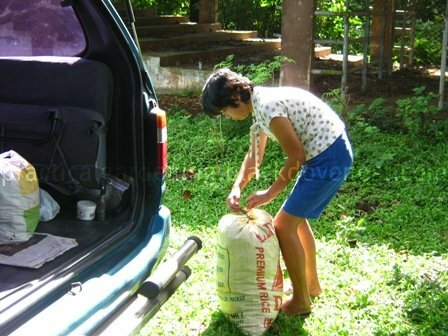 We were able to collect close to two full sacks of organic fertilizer. We would've collected more cow manure had we brought more sacks. Here, DH ties up one of the bags to be loaded into the van. Anyway, there will be other times and hopefully, when we come back, there will be more nicely aged free cow manure to shovel. Oh so you've been there, haven't seen it since we have Animal Science courses in undergrad years. Did you see the carabao with open stomach, only a patch covers the window, that is for research purposes! I wish i can visit that area again sometime. Open stomach??? No, I don't think so. The goat was already sort of scary-looking with that metal plate. I initially thought something for recharging. I love cow dung as soil for my plants. I am used to digging around dried manure in our subdivision. When planting, I used my bare hands to crush those bulky one.